AVID stands for Advancement Via Individual Determination. It is a college prep elective class that targets potential college students who are not enrolled in advanced classes and who are traditionally underrepresented in higher education. AVID helps prepare students for college by teaching them study and organizational skills. For more information on AVID, CLICK HERE. MARYSVILLE – Advancement Via Individual Determination started at Totem Middle School seven years ago. So some of this year’s seniors are the first to graduate having taken AVID throughout. It shows in the numbers. Of the 30 AVID students graduating, about half have been accepted into universities. Many are the first in their families to go to college. “That’s what AVID’s all about,” said Lori Knudson, an executive director with the Marysville School District. Families gathered with the soon-to-be graduates prior to Monday’s school board meeting to celebrate. Knudson was joined by Stephanie Zikopoulos and Amy Price at the meeting to explain AVID’s success even more to the board. 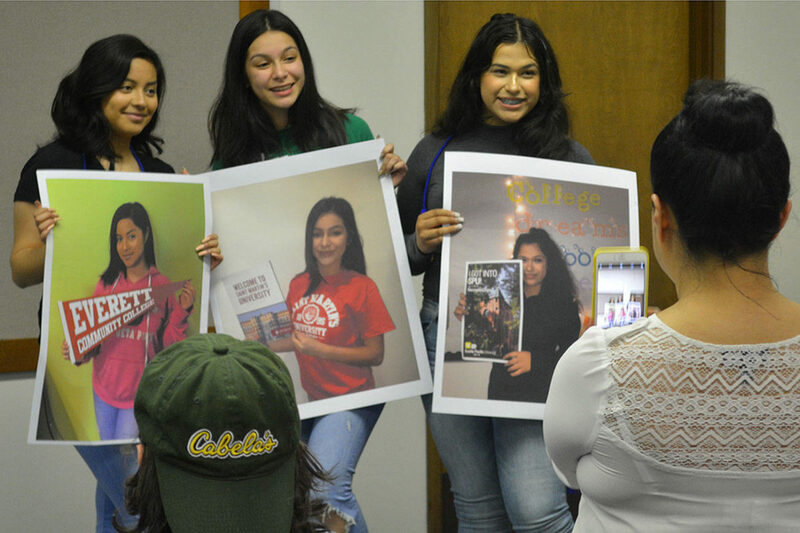 They said when AVID started there were 30 students in that seventh-grade class. Now, 1,061 students have participated in AVID. They showed a video where AVID grads talked about becoming everything from an engineer to a detective to a surgeon. They are going to colleges mostly all over Washington state. “Never give up” was a common theme. During the presentation they said there currently are 124 AVID students and 71 have been involved for at least three years. They introduced Callie Tonseth and Allison Carroll, who have been involved with AVID from the start. Callie said the program helped her the most with time management, while Allison said it helped her be organized. “It’s extra work, but it’s so worth it,” Allison said. M-P AVID grads are: Meagan Anderson, Shaylee Bass, Alicia Campos, Emmanuel Chavez Dela Cruz, Elena Everybodytalksabout, Vanessa Guzman, Gladis Jimenez, Sophia Kedziorski, Caleb Lingle, Phillip Perez, Michael Ray, Alejandra Rivera, Priscilla Sulog, Madison Wahlgren and Annaleese Zamudio. MG: Mikita Aldan, Allison Carroll, Archie Castillo, Daniela Castro-Martinez, Mackenzie Gagnon, Susana Gaona-Espinoza, Maria Gonzalez-Perez, Bianca Hernandez-Beltran, Micah Hoot, Lorena Lopez-Hernandez, Richard Meza, Alejandra Nunez, Yoselin Ramirez and Callie Tonseth. Also at the meeting, community activist Preston Dewoskin presented an award to James Stevens, executive director of special education, who is leaving the district after three years. “It was horrible three years ago,” before Stevens took over, Dewoskin said.